Welcome back my friends to the show that never ends. 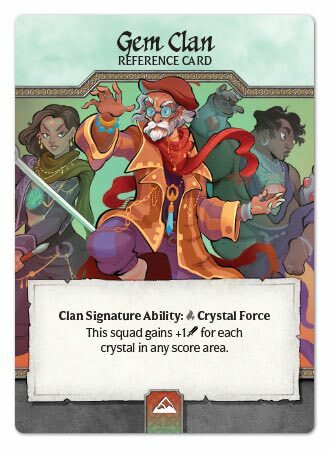 Only the Gem Clan could put on the performance of a lifetime, for as crystals are scored in games of Crystal Clans, the Gem Clan grows in strength. Units that possess Crystal Force grant strength to their squads as more crystals are discovered. At the start of the game, this ability grants nothing, often leaving your units weak and underpowered, but by the end of the game, this ability can grant up to 6 attack to a squad, allowing Gem units to become one of the best bargains we’ve ever seen. No one demonstrates this better than the Crystalsmiths. You’ll likely struggle to find a use for them at the beginning of the game, but once the crystals start rolling in, they can become a fast moving, 9 attack/1 defense unit for the cost of one initiative. 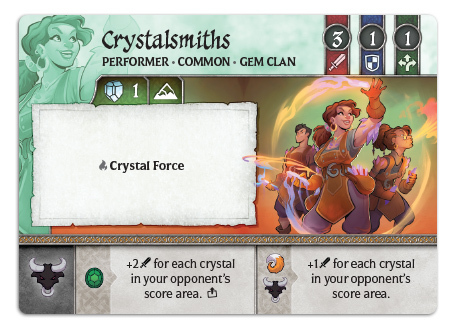 Remember though, Crystal Force grants the ability to the squad, so multiple Crystalsmiths units in the same squad don’t get to stack the benefit. Sometimes survival is more critical to your plan than the ability to destroy the enemy. 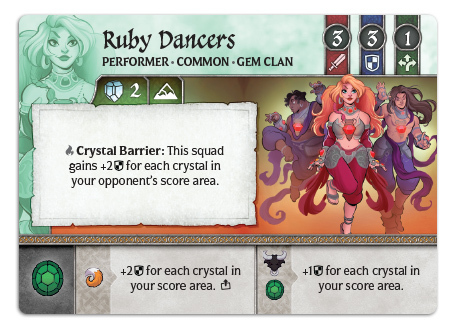 Ruby Dancers flip the script on Crystal Force, and instead make use of a Barrier. Crystal Barrier saps the energy from your opponent’s earned crystals and uses it to deflect incoming attacks. The more crystals that your opponent has scored, the stronger the shield becomes. Boldo is a unit that I always make a point of emphasis to bring onto the battlefield. Reducing the cost of Crystalsmiths and Ruby Dancers, who combined comprise half of your common units, makes them a steal. And since he has the Crystal Force ability as well, his performance can be one like no other. 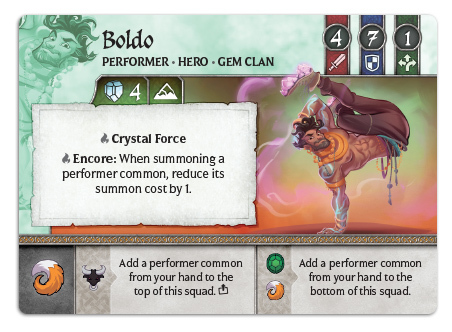 Alternatively, his battle effect allows you to add a performer unit to the top of a squad, essentially allowing you to add Crystal Force or Crystal Barrier to a squad as a great surprise. 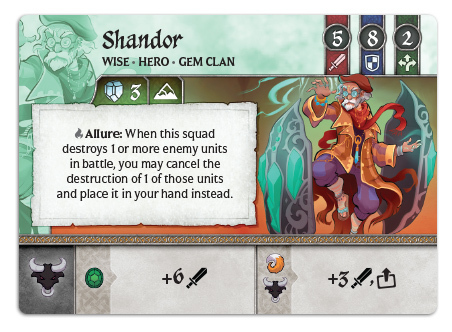 Shandor’s Allure ability is one that we’ve seen before in Water Clan, but it’s no less special when it makes its appearance here. Allure allows you to take control of a destroyed opponent’s unit, essentially using their strength against them. However, with the ability on a Hero unit, Shandor’s longevity should allow you to make use of the ability multiple times per game. I hope you can see how things can start to spiral out of control and into your favor when you play as the Gem Clan. In the next article, we’ll take a final deep dive into the Moon Clan. There’s not a ghost of a chance that you’ll want to miss that. Both the Gem and Moon Clan are availabe now from retailers and on our own web store!